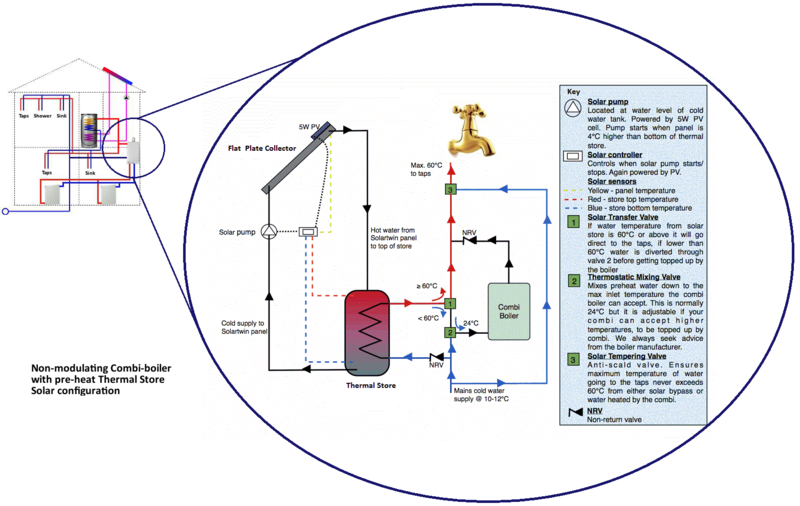 Home » Solar Thermal Information » Is my property suitable for solar thermal panel technology? 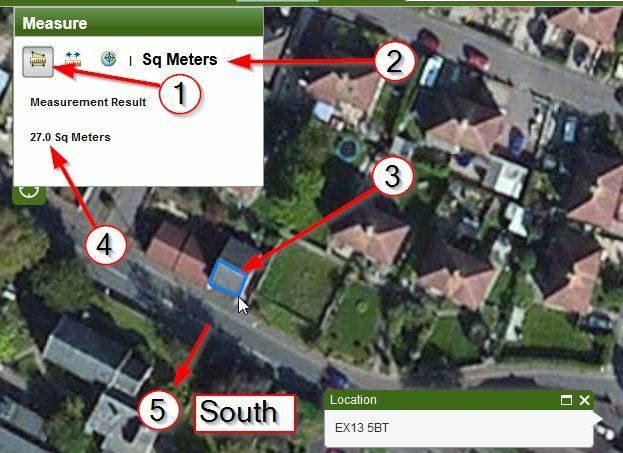 A wide range of geographical factors will inevitably impact upon the output of your solar thermal installation. 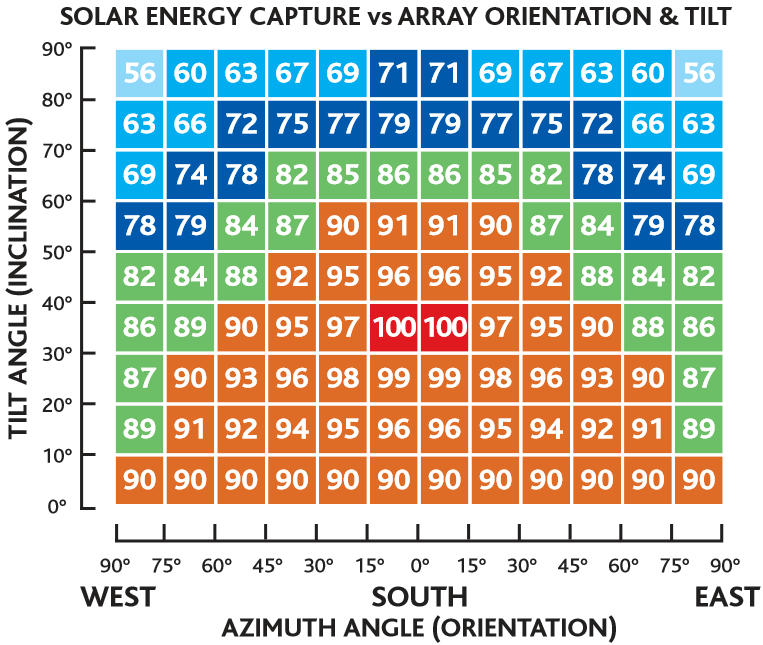 Southern and coastal areas receive the most sunlight, although most areas of the United Kingdom are suitable for the generation of solar energy. It is vital that the property’s roof has little or no shade coverage throughout the day (from trees, hills, other buildings etc.). Even slight shade coverage can greatly reduce system output. If your roof has significant shade coverage, solar thermal panels will not be appropriate. In this case it may be best to look at an air or ground source heat pump to produce low carbon energy. Provided that there are no shade issues, all areas of the UK are suitable for solar energy technology. You can check the level of sunlight that your area receives using the Met Office’s UK solar irradiation map. The majority of roofs in the UK have a tilt of between 30°-45°, though a roof tilt of between 0° and 50° from the horizontal should provide a good output. It is a very common practice to integrate solar thermal panel technology into existing water heating systems. You will be able use all of the existing radiators and pipework, though in some cases it may be necessary to buy or use an existing boiler to accommodate the solar thermal system. If the property has a conventional boiler, integration of the solar thermal system should be relatively simple: all that will need to be done is to fit the solar collectors on the exterior of the property and replace the previous hot water tank with a twin coil water cylinder. This new cylinder will contain the coil tubing from the solar collectors and one from the existing boiler, used as a backup heat source, with the priority always given to the sun. If your property has a combination boiler (also called a ‘combi boiler’), which takes cold water straight from the mains water supply and heats it as and when it’s necessary, integration of a solar thermal system may be more difficult as combination boilers also avoid the need for a separate water cylinder. 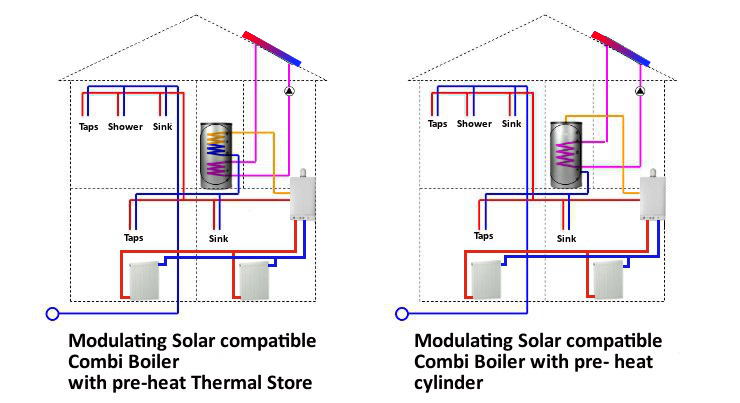 There are two main types of combi boilers; modulating and non-modulating, the modulating variety adjusts its burner to compensate for variants in the temperature of the incoming water, (applying just enough heat to get the water to the desired temperature) however the non-modulating boilers will not. 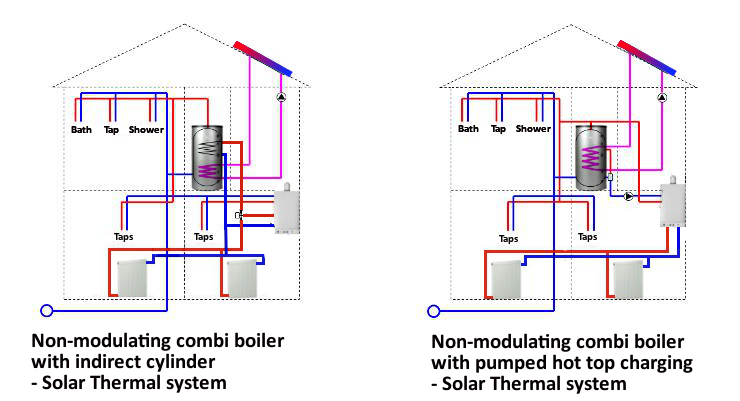 It is the non-modulating variety that will increase the cost of the solar thermal system installation as more components are necessary to make the system function efficiently (see below diagrams). Some (though not all) combi boilers may be compatible with solar thermal technology. If yours isn’t, you may need to purchase a new, compatible boiler or the necessary thermostatic mixing valves and tempering valves (see below diagram). If you chose to go down the new combi boiler route this will add between £1,500 and £2,000 to the total cost of the project so you could even consider a heat pump, biomass boiler or even a micro CHP boiler as well. Prospective solar thermal installation companies should advise you on this.